A Goal Event was held on 25th April 2015 in Makeni Township in partnership with St Anthony Catholic Church in Makeni. The total number of participants was 134 participants between the ages of 12 – 20 years old and 18 women above the age of 25 from the surrounding community. We also had 32 boys who participated in separate ball activities under our Girl Power activities. The event was graced by the area Councillor Mr. Champion Tembo who emphasized the need to have physical and life skills activities for young people in Makeni. The participants played games such as my rights, hygiene tag and they also played a game called protect the bee where girls are taught on how to withstand peer pressure from their friends and how to say No and stand by their word. The girls also played a game called silent ball from be yourself. This game helps girls to understand the value of non-verbal communication. This game doesn’t allow girls to use their voices when they play the game. The participants also played games from be money savvy; Zig Zag savings, savings plan. The Zig zag game helps girls to understand what is meant by saving and also the importance of saving. During the discussions after the game the girls were asked on some of the ways they save money and why they save money. When the participants were asked about the importance of saving, some girls said they save money to buy clothes and also help at home when need arises. See more pictures from the event here. [By Ms. Aya Noguchi, Lusaka] Goal Localised Event and Kicking AIDS Out Sessions were held in George Compound on 23rd of March, I had some discussions with members of Miracle Disabled Group to learn more about their work. NOWSPAR have been working with Miracle Disabled Group since 2012 as one of NOWSAR’s chapter as well as social inclusion program with handicapped people through sports. George Compound is located on the North Western side of Lusaka, where is one of the places that many handicapped people are gathered because of low accommodation fee and living expenses. Miracle Disabled Group consists of more than 300 members both elderly and young men and women with varied ranged of age between 12 years old and 60 years old. The main purposes of the organisation are lobbying and advocating for development and implementation of policies of protection of handicapped people as well as engaging civil society in their activities. NOWSPAR has supported the group in ensuring that they have a sustainable sports structure that gives everybody in the community an opportunity to participate sports and physical activities and received some benefits from them. Sports and physical activities haveempowered member of Miracle Disabled Group and given them energy and socialize opportunities. NOWSPAR had opportunities to conduct informal interviews with Ms. Bernadette Mindeo who is General Secretary of Miracle Disabled Group and two young male participants from community based football team, who were in the Kicking AIDS Out program. Ms. Mindeo demonstrated her application to NOWPAR’s support to her organization. She mentioned that NOWSPAR has brought energy and motivation to handicapped people. For them, it is very difficult to create new networking and socialize with people from outside of their community. Therefore when NOWSPAR con ducts some activities, those handicapped people get opportunities to meet new people and create new networking with people from outside. She also explained how much sports have benefited to their life. Sports create opportunities for them to be included in their community and society. They are able to enjoy watching sports activities and playing some sports such as Netball, Volleyball, Football, Chess and Darts with other community members who don’t have handicap. These opportunities have empowered handicapped people and provided them better life. Since NOWSPAR has supported them to become sustainable organization, our supports are flexible according to their projects. NOWSPAR believes that whether people are disabled or not, everybody with passionate about changing their community better, can become good community leaders and sports has power to move forward the initiative. Ms. Mindeo participated in the Digital Story Telling project by NOWSPAR and WomenWin listen to her story here. 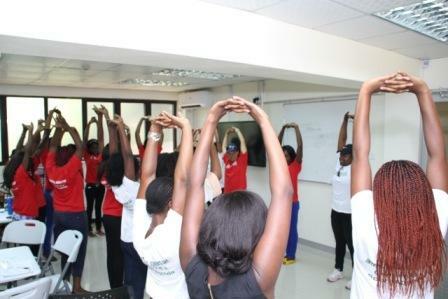 Two participants demonstrated high interest to become facilitators of Kicking AIDS Out. They are also member of community-based men’s football team. They are looking for an opportunity to make positive impact on their community. He explained that there are a lot of graduated young men who can’t find any job opportunity. They have been empowered by the people from Miracle Disabled Group and how much influence they have been given by handicapped people. They believe that they can do a lot more for people in the community as the 40 years old handicapped lady has given through sports. They were guided to discuss with Ms. Mindeo from Miracle Disabled Group as well as NOWSPAR representative for future support possibilities. Ms. Mideo also showed some interests to work with group of young men and encouraged them to create a women’s football team in their club. This is one of the model cases how handicapped women encouraged young non-handicapped men to become community leaders through sports. NOWSPAR has lined up a series of three (3) Financial Literacy sessions as part of the Goal program in three places namely Kalingalinga, Garden and Makeni. The sessions are focusing on financial literacy to commemorate Financial Literacy week which is from the 13th to the 19th of March 2015. The main life skills being explored are the art of saving, challenges to saving, budgeting and ways of making money. 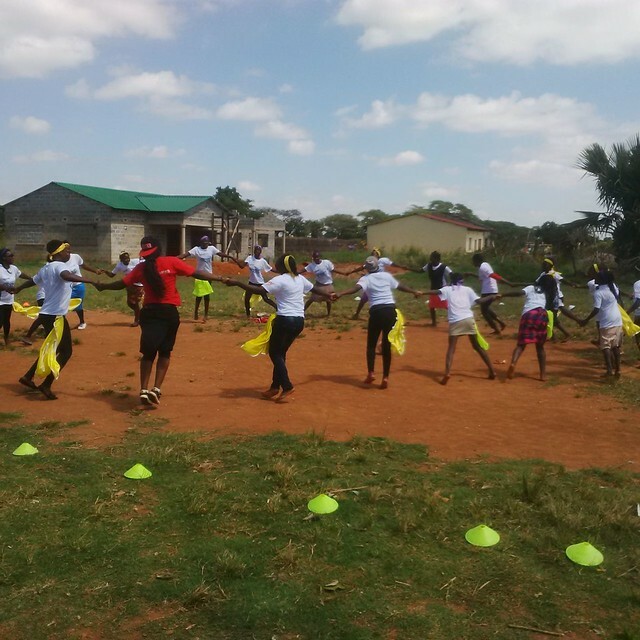 The first session was held on 17th March 2015 in Kalingalinga with 31 girls aged between 9 and 18 of age of the EduSport Kalingalinga Sport Club who participate in Netball and Football teams were engaged in a group discussion and question and answer style of session. 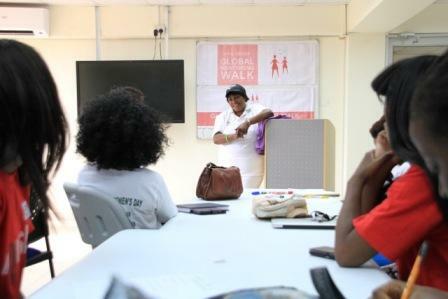 The participants gave information on what they already knew on the topics outlined and most of them seem to be well informed were making money and saving was concerned. “ When I see that my mother has no money to give me to buy new clothes for Show Time [A Youth Variety Show], I start collecting pieces of cloth from tailoring shops and make door mats which I then sell and save the money till its enough for me to get the clothes I want” said Hope, a participant. Other examples on how the girls make money included selling guavas which grow in most back yards, plaiting hair and freezing water in plastics for sell. 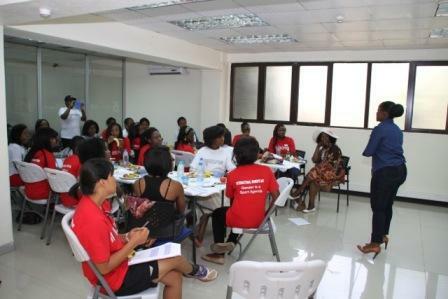 The participants however were not so familiar with the art of budgeting. The NOWSPAR team conducting the session played movement games that enforces this life skill and had a discussion to reinforce information and respond to questions. “…most of the times when I have money, I just go to the market and buy the things I see and I like but then when I get home I regret and wish that I still had my money .” Said Catherine, a 16 years old Netballer. After all the games and discussions the girls were asked to reflect on their personal lives and see how they can improve the way they spend and the importance of saving from the little money they come across. 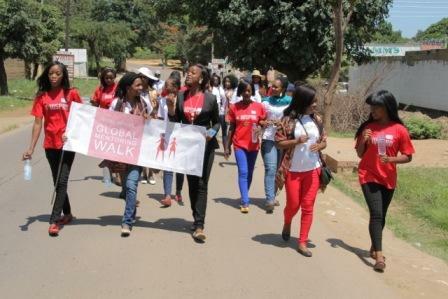 The 2015 Vital Voices Global Mentoring Walk in Zambia was held on 9th March 2015 in Lusaka led by Flag Bearer Lumbiwe assisted by VVLead Fellows Sandra Ndona and Lombe Mwambwa who is General Secretary of NOWSPAR. 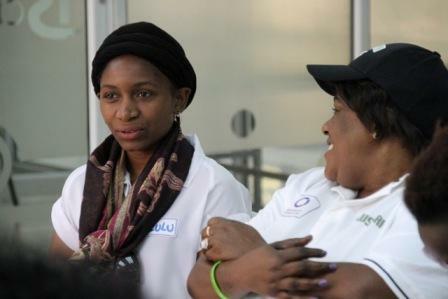 Ms. Matilda Mwaba (Founder of NOWSPAR and Current Africa Representative to the International Working Group on Women in Sport) was the Lead Mentor at the Women’s Leaders Mentoring Walk workshop as a keynote speaker. In her speech, Ms Mwaba shared her story of how she has built up her professional career in sports administration and advocacy. She emphasized to young female leaders of importance to believe in themselves to achieve their own professional goal. Since it is a challenge for young women to find their role models and create networks in the professional field, the mentoring approach is very crucial for developing young women’s leaders. The walk provided an opportunity for personal interaction to share experiences, ideas and establish mentoring relationships and goals. The second speaker, after the discussion and mentoring goal-setting sessions, was Ms. Noreena Chiteba, Pesident of the Zambia Squash Association and Founder of KUPES Network a Leadership Program for Young Women. 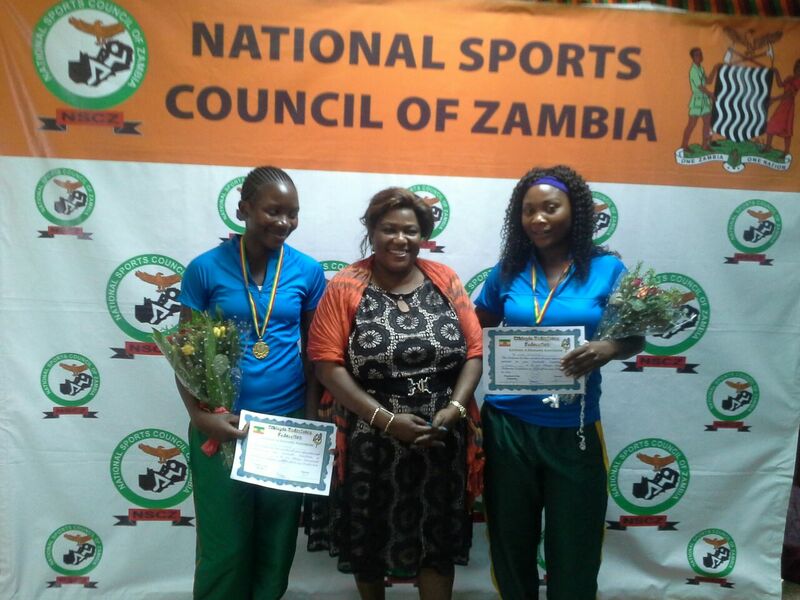 Ms. Chiteba is also a member of the National Sports Council of Zambia Gender Committee and an active part of the Women in Sport Leadership Network. 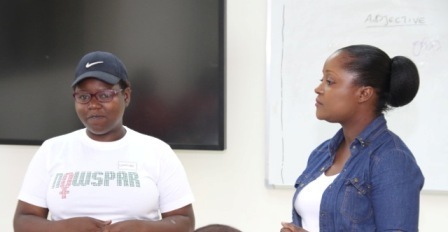 NOWSPAR Intern Ms. Aya Noguchi was also a participant in this event and will work with VVLead Fellow Lombe on mutual goals around advocacy, academic progress and research on women in sport. 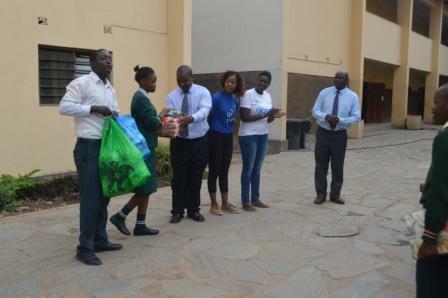 The event was hosted at iSchool Zambia offices, Lulu and Sandra are members of staff of iSchool while NOWSPAR, Lombe’s organisation provided the T-Shirts for the event. The three fellows fundraised from friends and family to meet the costs of the event. 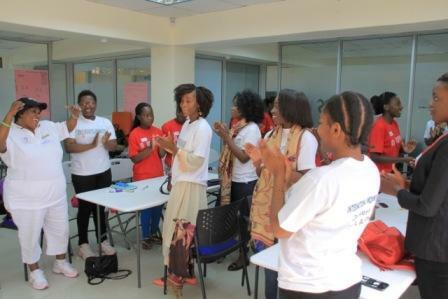 Some immediate results of this event are that the girls have been invited to participate in a mentoring workshop by KUPES Network the following weekend. A network of mentors and mentees has been started to provide continued opportunities for networking and development and monitoring of the mentoring targets and actions plans. The Mentoring Walk is an initiative of Vital Voices, which is a global women’s leaders mentoring program based in United States and this year more than a thousand women in 73 locations in 53 Countries have participated in the Walk. 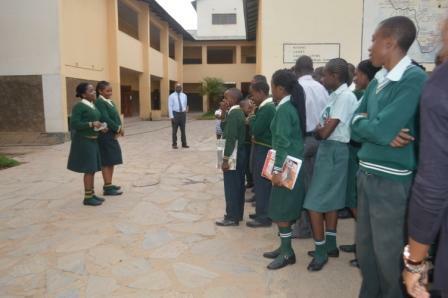 See more pictures of the Mentoring Walk and other activities here. Girl Power Club Members Kate and Natasha speaking to fellow pupils about Goal Sessions during School Assembly. Presenting Sports Equipment from NOWSPAR to the School for Netball and Football for use by both girls’ and boys’ teams. 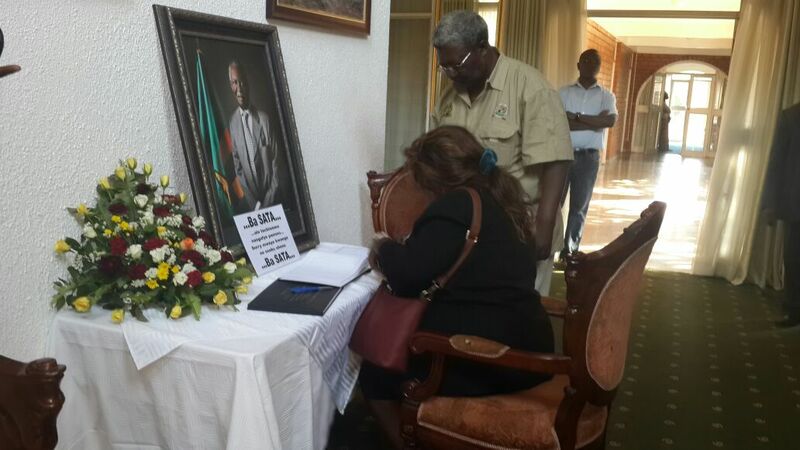 NOWSPAR Executive Director Matilda Mwaba this afternoon signed the Book of Condolences at the Government House in respect of the late President Michael Sata. 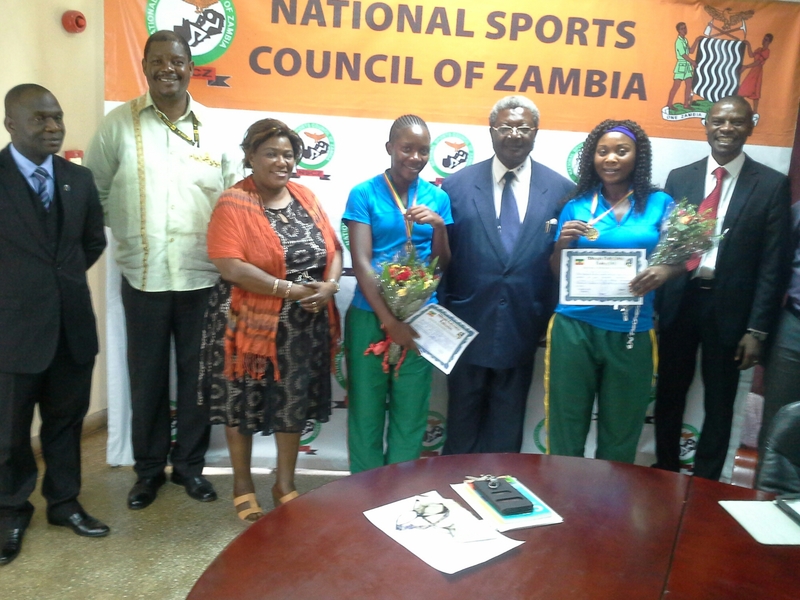 Ms. Mwaba was part of the delegation led by the National Sports Council of Zambia Chairman Mr. Mwaba Kalenga. The delegation comprised of the NSCZ Board (Ms. Mwaba is a Board member) and several National Sports Associations. NOWSPAR Board and Staff are deeply sad and wish the family of Mr. Sata well in this tragic time. Sisters Everlyn and Olga Siamapangila won Gold Medals in the Badminton Women’s Double at the Ethopian International Tournament in Ethopia. The competition had 10 countries participating.